The most versatile Pilates tool for effective rehabilitation. 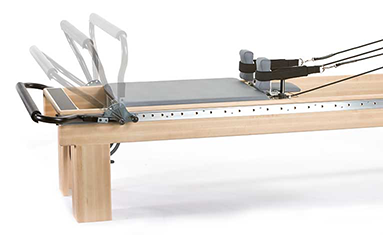 The Pilates Clinical Reformer® facilitates safe and rapid rehabilitation of orthopedic, neurologic and chronic pain conditions. 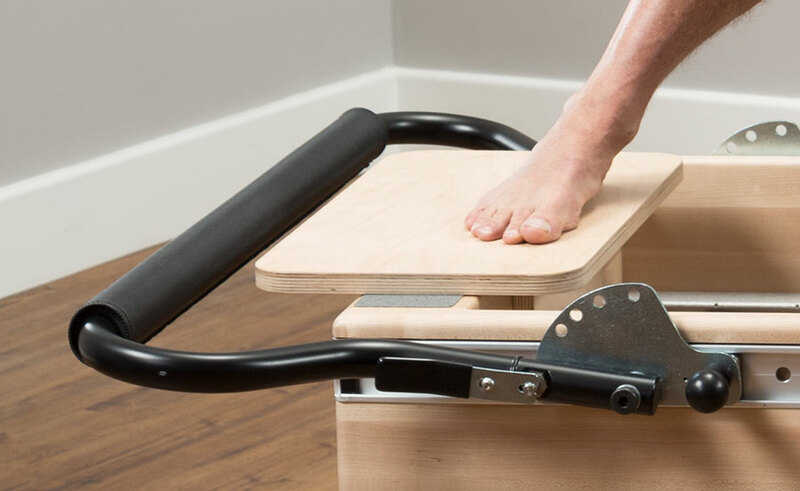 For 40 years, Balanced Body has worked with rehabilitation professionals to develop the features that make our Clinical Reformer® a versatile and practical rehabilitation tool. Offering unsurpassed adjustability, the Clinical Reformer® combines the most innovative Footbar and Springbar systems available. The revolutionary Infinity Footbar® and Revo Springbar™ systems give you more than 160 adjustable, locking positions. This allows you to accommodate people of virtually any height and level of ability, including children. Used by clinicians in private practice, rehabilitation facilities and hospitals worldwide, our Clinical Reformer® provides superior performance under the rigors of daily rehabilitation use. The Clinical Reformer now features Balanced Body TwistLock™ shoulder rests. Adjust or remove your shoulder rests quickly with no need for tethered pins. Secure and quiet! Standard sitting box, Padded Jumpboard and Oversized Standing Platform. Padded double loops, padded single D-Ring loops and padded footstrap. Pair of adjustable thigh cuffs and ankle cuffs. Free Infinity Footbar® Video, a 60-minute intermediate workout from Tom McCook that showcases the creative exercise possibilities of this innovative footbar. Padded Jumpboard and Oversized Standing Platform. 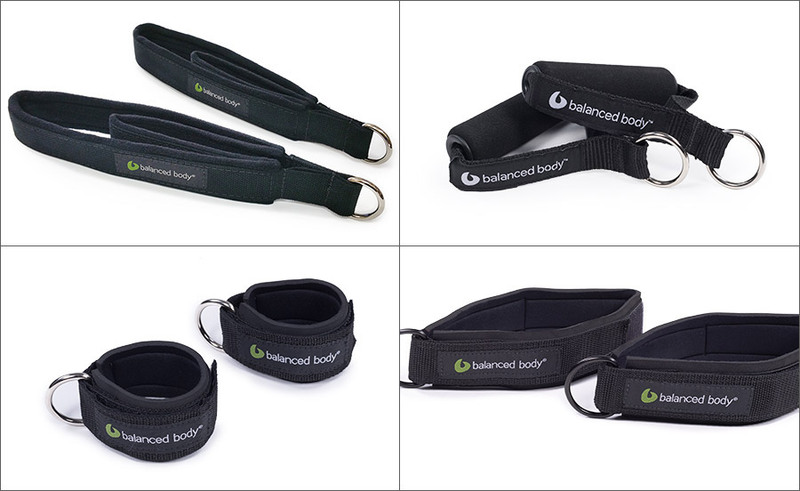 Padded Double Loops and Foot Strap, Neoprene® handles and Padded Single D-Ring Loops. Adjustable thigh cuffs and ankle cuffs: one pair each. Streaming workout video available, a 60-minute intermediate workout from Tom McCook that showcases the creative exercise possibilities of this innovative footbar. Choose a frame height to best meet your ergonomic needs. a. 14” (36cm) — Standard height, great for all exercises including standing work, and for facilities with low ceilings. b. 18” (46cm) — Less bending for clinicians when working with patients, and good accessibility for wheelchair transfers. c. 24” (61cm) — Easiest working height for clinicians and manual therapy. Good for patients challenged by getting on and off a lower Reformer. More challenging for standing exercises. Retractable metal risers are easy to calibrate and allow for quick mat conversions. Risers lock into 4 positions for accurate adjustment. Strata Rock Maple with Limited Lifetime Warranty. See wood choices for other options. Hand-finished frame with a top-grade catalyzed conversion lacquer and lustrous satin finish. Adjustable risers with swivel pulleys that allow variable angles of resistance — ropes can be pulled easily in any direction. Pulleys can be elevated from 2” to 13” (5cm to 33cm) above the frame. Built-in Standing Platform, 27” x 4.5” (69cm x 11cm), with 24” x 3.5” (61cm x 9cm) rubberized non-slip surface for safety. Frame pre-drilled for Tower Retrofit Kit and Proprioception T-Bar mount. Infinity Footbar provides five vertical and 32 horizontal positions to fit patients of all heights, including children. As you increase or decrease the distance between carriage and footbar, the carriage travel distance remains the same. Easily adjusted Revo Springbar™ system features 5 positions with 12” range. Padded headrest moves vertically in 3 positions: 2 above the carriage, 1 level with the carriage. Carriage custom stability padding. Upholstered in heavy-gauge vinyl. Details below. Accurate springs ensure risers can consistently repeat movements. 6-spring format enables you to configure up to 46 resistances. Your choice of spring weights. Standard configuration: 1 blue (light), 3 red (medium), 1 Yellow (very light), 1 green (heavy). 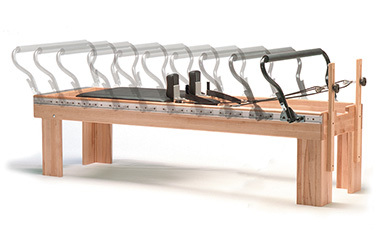 More about our Reformer springs. Height: 24” (61cm). Can also choose heights of 18” or 14”. The Infinity Footbar® was originally designed for pediatric physical therapy, and is the most adaptable footbar available today. The Footbar adjusts along the entire length of the frame to support a whole new realm of exercise possibilities, including upper body work. Five vertical positions and 32 horizontal positions give the Infinity Footbar 160 locking positions to safely accommodate people of all heights and levels of ability, including children. Combine the Infinity Footbar with the easy-to-use Revo Springbar™ for the most precise system available, or choose the more traditional No-Roll Springbar. Carriage and Springbar are integrated - moving the Springbar moves the carriage. Five carriage stop positions provide 12” of adjustability from carriage to footbar, creating the ergonomically correct position for every user. For short to average height clients, use positions #1or #2. For taller clients, or those with a limited range of motion, use positions #3 - #5. Single-rope pulley system; move all four limbs independently. 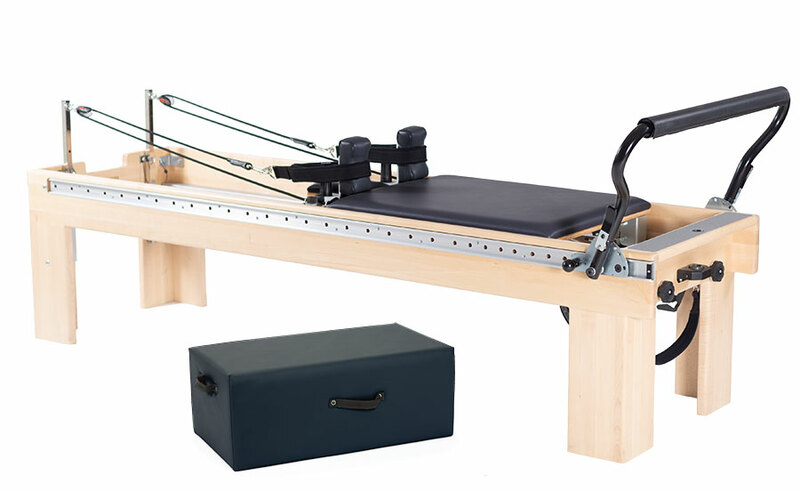 Transform your Reformer into the most versatile machine available! Enables clinicians to assess asymmetries in patients.